When researching to buy a new monitor, some folk mainly focus on display specifications regardless of the manufacturer while others strictly stick to the brand they are familiar with. Whether you had a pleasant experience with their customer support, you’re already a satisfied owner of other tech devices by ASUS or you’re simply looking for something new, ASUS lives up to their reputation. Along with Acer, ASUS is the leading company when it comes to gaming monitors. Some of the gaming monitors we included in the list are the absolute state-of-the-art display technology that not only improves your gameplay experience but gives you the edge over your opponents as well. 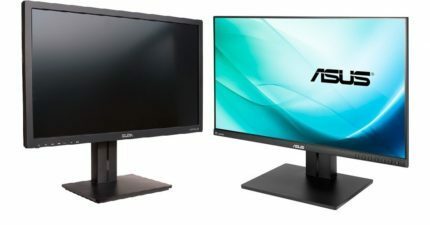 Besides offering the best gaming monitors of 2019, ASUS has several high-end displays for color-critical work in addition to some first-class monitors for casual use which are available at alluring prices. ASUS and Acer also have new cutting-edge gaming monitors in the works which should be available in Q1 2019; The awesome 4K monitor with 144Hz refresh rate and G-Sync HDR – the ASUS PG27UQ, and the revolutionary ultra-wide display with 200Hz refresh rate and G-Sync HDR – the ASUS PG35VQ. 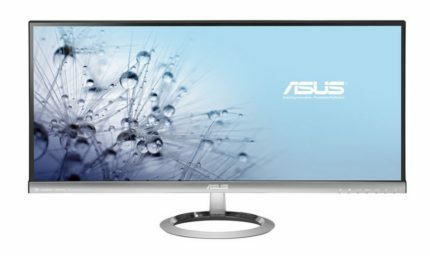 Unless you’re saving up for one of these bad boys, you’ll find the perfect ASUS monitors in this guide. These displays, whether gaming or budget, are tested and approved; as long as you stick with our guidelines about what specs fit your needs, you’ll have peace of mind with your purchase. As you can see, there are quite many ASUS monitors out there. Continue reading to find out what each specification means so that you don’t end up with a monitor with features that you won’t need but rather with a perfect one for you. After that, we’ll go into the most important details about each one; additionally, you can search for more thorough reviews of these monitors on our website. IPS, TN, or VA Panel? If you’re a competitive player striving towards professional FPS gaming, you’ll want to stick with TN panel monitors. The TN displays allow for the quickest response time speed up to 1ms which entirely eliminates ghosting and blurring of the fast-moving objects. These are the most affordable displays out of the lot, but they also have certain disadvantages; although none of them crucial to gamers. In comparison to the IPS and VA panels, the TN monitors have poor color quality and narrow viewing angles which result in color and contrast shifts when the image is viewed from certain angles. The IPS panels have the most accurate and consistent colors while the VA displays have the best contrast ratio that delivers exceptionally deep black tones. The viewing angles aren’t an issue with these panels as they amount to 178 degrees in all directions. The response time speed is also almost identical, usually around 4-6ms, but ghosting is more visible with the VA panels. As panels differ individually as well, we’ll go into each panel’s performance later on. For more information regarding the panel types, go here. Although the Full HD 1920×1080 resolution has been the standard for quite a while, 1440p resolution monitors are getting more and more popular. However, with higher resolution comes more expensive computer equipment requirements. So, according to the games that you play, make sure you’ll computer will be able to handle the screen resolution with decent settings and performance. 1080p monitors are still popular as they aren’t as demanding as 1440p or 4K which allows you to play at higher refresh rates with a humble PC rig. And with IPS or VA panel, the image quality is vibrant and immersive. 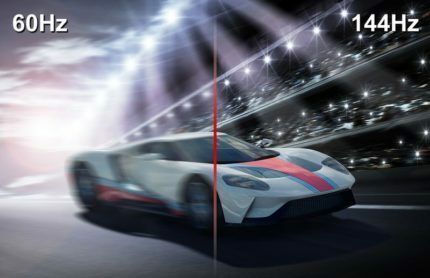 The 4K UHD resolution monitors are currently limited to 60Hz, so they’re not recommended for competitive FPS games even though the picture looks otherworldly. For FPS games nowadays, at least 144Hz refresh rate speed is a must as the difference is huge which you can see here. In comparison to the regular 60Hz monitors, the image refreshes more than twice as much which decreases motion blur and screen tearing allowing you to shoot down your enemies with ease. The difference between 165Hz or 180Hz and 144Hz isn’t that great, and may not be even noticeable to some players. But if you want that extra push and think you’ve got the eagle eyes, go for them as they aren’t that much more expensive. The 200Hz refresh rate and beyond is mainly intended for the high-end professional gamers. To further improve your gameplay experience, you can synchronize the refresh rate of your monitor to your GPU. FreeSync monitors require AMD FreeSync compatible graphics cards for the dynamic refresh rate while G-Sync displays need Nvidia G-Sync compatible GPUs. You can use a FreeSync monitor with Nvidia cards and vice versa, but you won’t benefit from the dynamic refresh rate. Within the dynamic refresh rate range, FPS (Frames Per Second) rate is more stable while screen tearing and stuttering is eliminated. In addition, Nvidia users can enable the ULMB feature instead of G-Sync, which decreases motion blur. AMD FreeSync has lower dynamic range than G-Sync but that can be altered via the custom resolution utility. FreeSync monitors are also significantly cheaper. We will go into more details regarding this later on. The ASUS ROG Swift PG279Q undoubtedly delivers the best gaming experience as it perfectly combines the 1440p resolution and vibrant colors of the IPS panel with the buttery smooth performance achieved by G-Sync and the whopping 144Hz that can be overclocked to 165Hz. The IPS panel ensures the flawless viewing angles, true 8-bit color depth with 100% sRGB color gamut, and rapid 4ms response time. There are numerous gaming features available including custom crosshairs for better precision in FPS games, on-screen timer, and pre-calibrated picture presets for different games (FPS, RTS/RPG, Racing as well as sRGB and Cinema modes). All of the features can easily be reached and adjusted via the intuitive 5-way OSD (On-Screen Display) joystick. There’s also the turbo hotkey for swapping between 60Hz, 120Hz, and 165Hz fixed refresh rates. Additionally, the ASUS PG279Q 165Hz gaming monitor has an attractive design with air venting, thin bezels, and versatile ergonomics. It’s VESA mount compatible, has 120mm height adjustment, 60-degree swivel, -5, 20-degree tilt, and 90-degree pivot abilities. Connector ports include a DisplayPort (for 165Hz), an HDMI 1.4 (max 60Hz), two USB 3.0 ports with fast charging, the headphones jack, and two 2W speakers. The 1440p resolution perfectly complements the 27-inch screen size as it results in rich pixel density of 109 pixels per inch. It’s the sweet spot for gaming as it offers plenty of screen space with maximum detail, it’s not too large nor too small. The ASUS PG279Q is, therefore, the best 27-inch monitor for gaming as well as the best 1440p monitor overall. We’ve thoroughly compared it with its Acer counterpart, the Acer Predator XB271HU, which you can check out in this article. Nowadays you can get a high-quality Full HD monitor for just around $100. There are still many choices though, and we recommend that you at least invest in an IPS display instead of the TN. The IPS panel monitors aren’t that much much expensive than the TN anymore, especially the budget series but the advantages are very much worth it. You’ll have a display with flawless viewing angles and a lot more vibrant and intense colors. 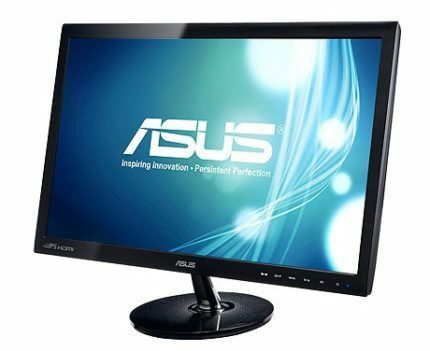 The ASUS VS239H-P is a popular and reliable monitor that will enrich your basic computer activities with striking image quality and smooth performance for an affordable price. It has an HDMI, a VGA, and a DVI connector. It’s VESA mount compatible and tilt-only by 25 degrees. With 5ms response time you can enjoy casual gaming with next to none ghosting while the exclusive SPLENDID feature offers several pre-calibrated for difference viewing activities. The ASUS VS239H-P display is flicker-free and has a low blue light filter, so you can work or play for hours without straining your eyes. For more cheap monitors, visit our best monitor under 100 USD and best gaming monitor under 150 USD articles. 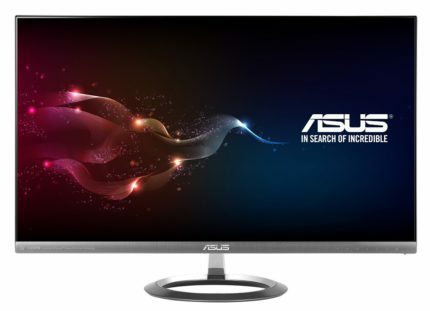 If you’re looking for a better IPS display which you can also use in multi-monitor setups, the newer ASUS Designo MX259H is a gorgeous yet reasonably priced Full HD monitor. It features an IPS panel with true 8-bit color support and 5ms response time. It’s not VESA mount compatible and can only be tilted by -5, 20 degrees, but it has 2x3W built-in speakers and 2x5W amplifiers for premium sound quality. There are two HDMI 1.4 ports and a VGA. You’ll also have access to the exclusive QuickFit feature which allows you to place a virtual grid on-screen to easily format your documents and photos. 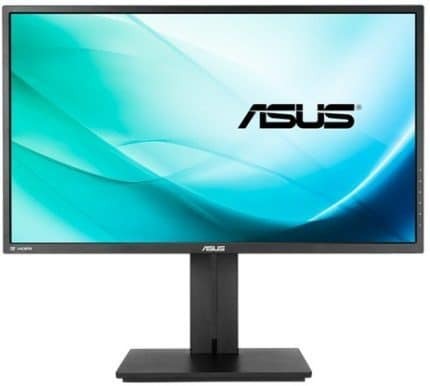 The ASUS MX259H display is also available in different sizes, but the 25-inch is the most cost-effective and will have the best image quality as for 1920×1080 resolution, 27-inch size isn’t recommended as the picture appears pixelated. The difference between 1440p and 1080p resolutions is significant. On a 1440p monitor, you don’t only get more screen real estate which allows you to comfortably view two browsers next to each other, but the picture becomes much clearer and detailed due to the higher pixel density. The ASUS MX27AQ is essentially a 27-inch 1440p version of the MX259H model except that it features a DisplayPort instead of the VGA port, and an extra HDMI with MHL support for content streaming of your MHL compatible devices. Moreover, the ASUS Designo MX27AQ has exclusive gaming features such as the GamePlus which consists of customizable crosshair overlays and an on-screen timer. There’s also the MultiFrame software for easier multitasking. There’s also a cheaper alternative though with thicker bezels but full ergonomic support. The ASUS PB278Q is based on Samsung’s PLS panel which offers equally good color reproduction as the IPS with 100% sRGB color gamut as well as 5ms response time and 178-degree viewing angles. If instead of buying an extra mounting adapter you want a VESA compatible display, you can get the ASUS PB278Q and save $40. Moreover, the monitor offers tilt, height, pivot, and swivel adjustments, 2x3W built-in speakers, and rich connectivity options including a DisplayPort, an HDMI, a VGA, and a Dual-Link DVI. The 32-inch version, the ASUS PB328Q is also very cost-effective with thinner bezels and immersive image quality. The ASUS PB258Q is an excellent alternative between the PB278Q and the MX27AQ. Although it’s 25-inch in size, it has a greater pixel density and therefore more space for details. It has thin bezels, it’s fully ergonomic, and it’s cheap. 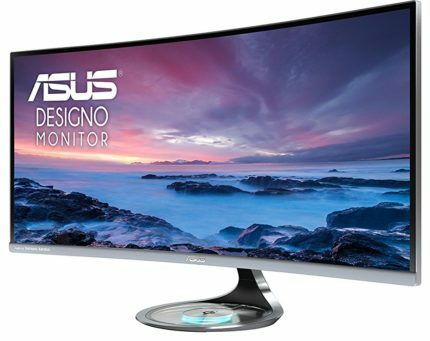 Here we have yet another ASUS display from the gorgeous Designo series, this time it’s an ultrawide display with 21:9 aspect ratio, 2560×1080 resolution, and an IPS panel. The ASUS Designo MX299Q is an ideal display if you enjoy watching movies and playing video games as it will provide you with a more immersive viewing experience. Make sure to check whether your favorite games support the 21:9 aspect ratio, or else you’ll have to play with black borders on the sides. Some movies are in fact shot in 2.39:1 aspect ratio while some Blu-rays offer you the ability to choose between 16:9 and ultra-wide formats for the perfect movie watching experience. The ASUS MX299Q ultra-wide monitor may take some time getting used to as it looks as if you’d put two 17-inch 5:4 monitors next to each other. However, once you give it some time, you’ll appreciate the extra horizontal space and the rich pixel density of 96 pixels per inch. For multitasking and productivity, you’re still better off with two 1080p monitors which you can get for the same price. The ASUS MX299Q IPS display is mainly intended for an engaging home video entertainment. It also has two speakers with amplifiers like the rest of Designo monitors. It’s not VESA mount compatible and it’s tilt-only. There is an HDMI 1.4 port with MHL support, a DisplayPort 1.2, and a Dual-Link DVI port. The IPS panel is true 8-bit with 95% sRGB color space coverage, 5ms response time, and 178-degree viewing angles. The ASUS Designo series also offers a 34-inch ultra-wide monitor with 3440×1440 resolution, but it’s twice the price of the 29-inch model since it also offers FreeSync and 100Hz refresh rate. If you’re a passionate gamer, it’s definitely worth it but it’s a bit much for everyday use. We’ll get into this ASUS gaming monitor later on. ASUS doesn’t offer any budget-friendly 4K monitors as they’re all either intended for professional use or gaming. The ASUS PB287Q 4K UHD LED monitor may be affordable but it has a TN panel and it’s only 28-inch in size. Its HDMI port maxes out at 30Hz at 4K, so it’s not recommended for 4K console gaming either. An IPS 1440p monitor would still have a better image quality overall due to the striking colors. Moreover, running games and everything else is still a lot less demanding on 1440p than it is at 4K. 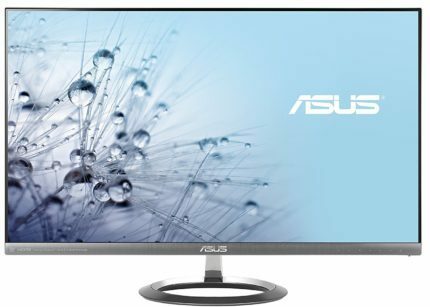 Another ASUS 4K monitor is the ASUS PB279Q with an IPS panel, but it’s more expensive than some equally good or even better 4K monitors out there. You can check out these 4K monitors here as well as in the link above if you’re looking for a budget 4K monitor. ASUS does have some of the best 4K gaming monitors, so stay tuned for those. So, if you really want a high-quality ASUS 4K monitor worth the price, we recommend you save up for one of the 4K monitors we’ll mention later. If you’re looking for a cheap gaming monitor with smooth performance, the ASUS VG245H offers plenty for a small price. First of all, it features AMD FreeSync technology for zero screen tearing and stuttering up to 75Hz if you have an AMD graphics card. Additionally, the 1ms response time speed of the TN panel ensures zero ghosting of the fast moving objects. The ASUS VG245H FreeSync monitor is fully adjustable with height, tilt, swivel, and pivot adjustments and offers exclusive GameVisual and GamePlus features. The former consists of several pre-calibrated picture presets for different game genres while the GamePlus offers crosshair overlays and an on-screen timer. Connectivity consists of two HDMI 1.4 ports, a VGA port, and two 2W speakers which make it a great monitor for console gaming as well. For $10 less it’s available as a model without height adjustment. It’s also available as a 27-inch screen but since it’s only 1080p the image would look rather pixelated if you’re sitting close to the screen. 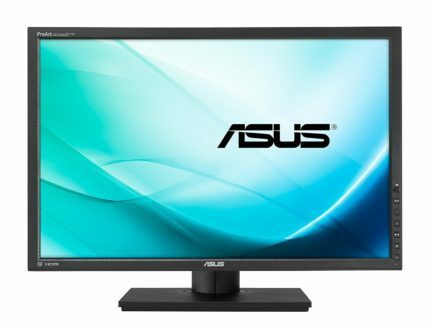 Therefore, the ASUS VG275Q 27-inch monitor is best for console gaming at 1080p/60Hz. 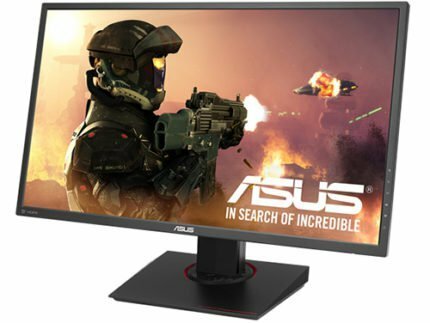 Although there aren’t any good 144Hz monitors under 200 USD, the ASUS VG248QE is quite close being priced at $230 at the moment. It offers everything you need to have the edge over your opponents in competitive games including the rapid 144Hz refresh rate and 1ms response time speed. The monitor is also fully ergonomic (VESA, tilt, height, swivel, pivot), has 2x2W built-in speakers, an HDMI 1.4, a DisplayPort 1.2, and Dual-Link DVI connectors. If you’re looking for a cheap 144Hz monitor, this is the best for the price. Unfortunately, the ASUS VG248QE 144Hz gaming monitor has no FreeSync support, but at this price it’s acceptable. 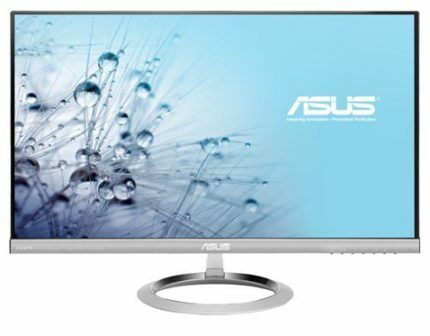 The 27-inch version of the monitor, the ASUS VG278Q offers the same specifications and features but has a pixel-y picture because of the screen resolution/size ratio. However, the pixelated image may actually help with aim precision in some FPS video games such as CS: GO. Both monitors are Full HD and flicker-free for long gaming sessions without eye strain. 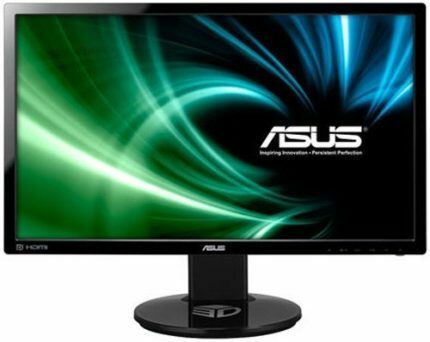 The ASUS PB277Q is one of the cheapest 1440p monitors available. Although its image is remarkably crisp due to the QHD resolution, for only $40 more you can get the ASUS PB278Q with an IPS panel and more vibrant colors. The ASUS PB277Q offers 1ms response time speed and 75Hz, but keep in mind that for less money you can get a 144Hz monitor which will give you a considerably better performance in fast-paced games. So, within this price range and GPU requirements, if you play slower paced games and want to enjoy the scenery and visuals, go for the 1440p monitor with an IPS panel. For competitive games, go with the 1080p and 144Hz with 1ms TN panel. After AMD has finally released Vega high-end graphics cards, 144Hz and 1440p FreeSync monitors have become more appealing because now we can enjoy the smooth performance of the dynamic refresh rate at high resolutions at more affordable prices. The ASUS MG248Q gives the fluid 1080p 144Hz 1ms gameplay a boost in clarity and responsiveness. AMD FreeSync will not only help with the FPS performance but eliminate screen tearing and stuttering as well as reduce input lag. 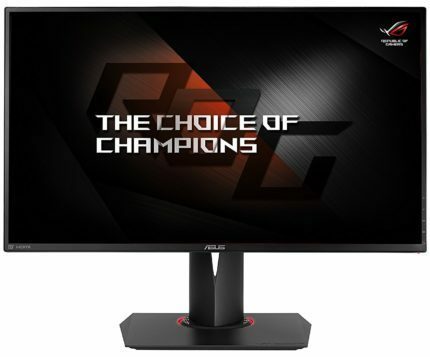 If you have or plan to get a high-end AMD graphics card, the MG248Q ASUS 24-inch gaming monitor is the one for competitive gaming. FreeSync is supported through the DisplayPort, while the HDMI and DVI ports max out at 60Hz. The monitor has full ergonomic support, 2x2W speakers, an intuitive OSD joystick, and the exclusive GamePlus and GameVisual features for game-enhancing and helping on-screen gimmicks. While some have to decide between a 1440p or 144Hz gaming monitor, others can afford both and now thanks to the Vega 64 they can enjoy the FreeSync monitors in their finest glory. Both the ASUS MG278Q and the ASUS MG279Q are based on the same elegant thin bezel design with anti-glare screen coating, full ergonomic support (VESA, tilt, swivel, pivot, height adjustment), two extra USB3.0 downstream ports, and 2x2W speakers. The only difference lies in the panel type, FreeSync range, and connectivity options. 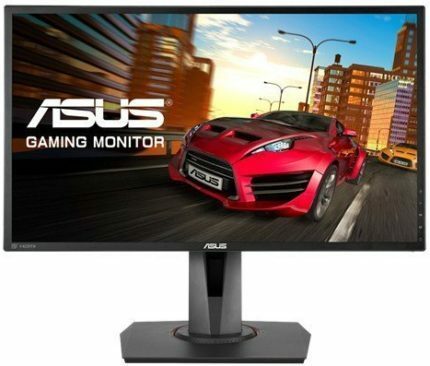 The ASUS MG278Q is the best 1440p 144Hz monitor with 1ms response time for the money as it is up to $150-$200 cheaper than its G-SYNC counterpart. 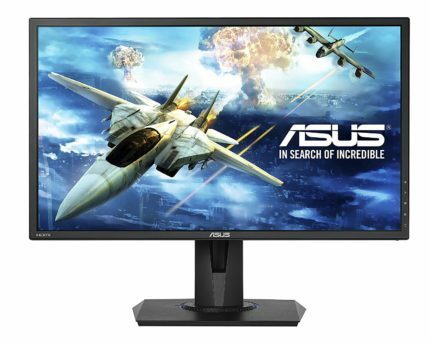 The ASUS MG278Q gaming display offers GameVisual (gaming picture presets) and GamePlus (crosshair and on-screen timer) features as well as the on-screen FPS counter which the MG279Q model lacks. Connector ports are as follows: two HDMI, a DisplayPort 1.2, and a DVI port. The ASUS MG279Q has two HDMI port as well, one of which supports MHL, a DisplayPort 1.2, and a mini-DisplayPort instead of the DVI. Both monitors have two USB3.0 ports and 2x2W built-in speakers. The ASUS MG279Q 1440p 144Hz IPS display has a narrow FreeSync range to 35-90Hz, but it can be easily extended to 57-144Hz via the custom resolution utility. FreeSync and 144Hz are supported via the DisplayPort, while the HDMI ports max out at 120Hz. The ASUS MG279Q response time speed is 4ms which efficiently eliminates ghosting. The IPS panel with 100% sRGB color gamut along with the crisp WQHD resolution ensures stunning visuals and immersive gameplay. The ASUS Designo MX34VQ has won the Innovation Award at CES this year and rightfully so; it offers a wide range of exclusive features along with stunning image quality and smooth performance. The huge 34-inch screen features 1800R curvature for better immersion into the on-screen content while the superior 3,000:1 contrast ratio makes colors come to life with black tones being truly black. The plethora of features consists of Picture in Picture and Picture by Picture modes, Splendid pre-calibrated picture presets, TraceFree technology for less ghosting, and four different sound modes (Movie, Game, Music, Custom) for the 2x8W built-in speakers. All of which can be easily adjusted in the user-friendly OSD menu via the 5-way joystick. As the ASUS MX34VQ is a gaming monitor after all, it also offers AMD FreeSync and 100Hz refresh rate for smoother gameplay. The response time speed of its VA panel amounts to 4ms (GtG), however, in comparison to the IPS, motion blur is more noticeable in fast-paced video games. While some players coming from faster response time displays may be repulsed by it, others won’t mind it at all and will instead enjoy the stellar picture quality achieved by rich contrast and crisp 3440×1440 resolution. Connector ports include three HDMI 2.0 and a DisplayPort. The GamePlus feature is also present (custom crosshairs, on-screen timer, and FPS counter) while FreeSync is supported within 48-100Hz range without custom altering. The ultra-thin bezel nicely complements the gigantic and curved screen and makes for a cinematic viewing experience. Lastly, you can charge your phone by placing it on the 5W/1A Wireless Charging pad. Overall, the ASUS MX34VQ FreeSync monitor is worth every penny as it offers quite a unique experience with brilliant image quality and fluid performance. If you mostly play competitive FPS games, then you’d be better off with a TN panel monitor with faster response time for significantly less ghosting. Or, if you really want an ultra-wide display, you could go for a more expensive IPS model with G-Sync, although it would still have perceptible motion blur, it would be less apparent. 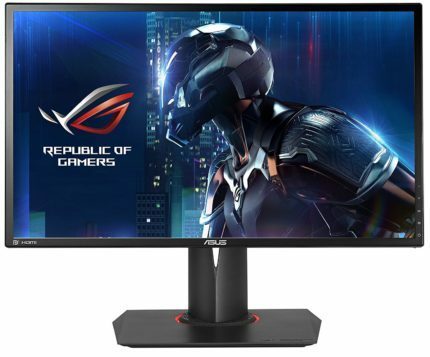 Unfortunately, there are no 144Hz 3440×1440 gaming monitors yet as ASUS and Acer decided to go straight to 200Hz with their upcoming ultra-wide displays. ASUS also lacks a 2560×1080 model with 144Hz refresh rate which is available by other brands such as the LG 34UC89G. Moreover, if you want an ultra-wide QHD gaming display with an IPS panel and FreeSync, check out the Acer XR341CK though with 75Hz. The ASUS MG28UQ offers an incredibly crisp image quality with smooth and responsive performance. Although AMD Vega 64 won’t be able to run everything maxed out at 4K, there really isn’t need for it as the UHD resolution alone makes for an outstanding picture. Although a TN panel, 100% sRGB color space is covered by 1.07 billion 10-bit colors (8-bit + FRC). Viewing angles are still 170/160 degrees but the 1ms response time speed eliminates any signs of trailing and offers a fluid gameplay. 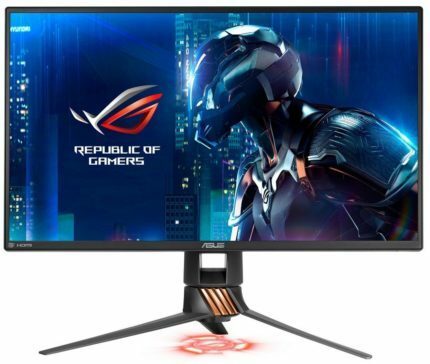 The ASUS MG28UQ FreeSync gaming monitor is fully ergonomic (tilt, pivot, swivel, VESA, height adjustment), has 2x2W speakers, two USB 3.0 ports, two HDMI 1.4, an HDMI 2.0, and a DisplayPort 1.2a. Both DisplayPort and HDMI 2.0 ports support FreeSync while HDMI 1.4 port maxes out at 30Hz at 4K. The ASUS exclusive GamePlus and GameVisual features are available as well. 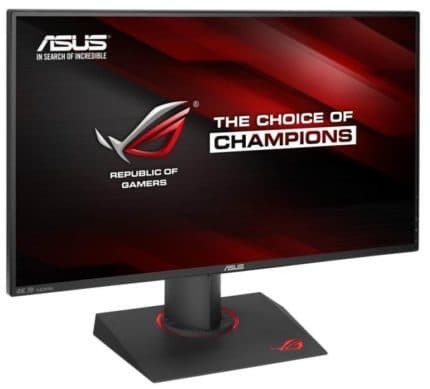 The 24-inch version, the ASUS MG24UQ features an IPS panel instead of the TN, but since it’s only 24-inch in size and supports only 8-bit 16.7 million colors, we recommend saving up for the following monitor – if you’re in pursuit of a 4K IPS FreeSync gaming monitor. 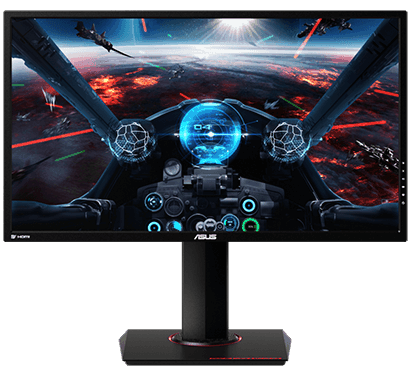 Note that ASUS has just released another 4K FreeSync 1ms gaming monitor which you can check out in our ASUS VP28UQG preview. In comparison to the ASUS MG28UQ, it has all the same features but no ergonomic supports though it’s $50 cheaper at the moment. The ASUS MX27UC is based on AH-IPS panel with 100% sRGB, 10-bit color support through dithering, 5ms (GtG) response time, and rich 1,300:1 contrast ratio. Along with the brilliant image quality with accurate and consistent colors, the ASUS MX27UC display offers FreeSync for smoother performance as well as the GamePlus feature. Additionally, the monitor offers two high-quality 3W speakers with 5W amplifiers and the ability to stream music through Bluetooth. Just as the rest of the Designo series monitors, it has only one flaw – the ergonomics, as it’s tilt-only by -5,20 degrees and has no VESA mount compatibility. Connector ports include an HDMI 2.0, a DisplayPort 1.2a, and the USB-C which can simultaneously stream audio/video content, transfer data, and charge the connected compatible device. There are two extra USB 3.1 ports with fast charging. While fast charging is enabled in the OSD, data transfer is disabled. Although the numerous features of the ASUS MX27UC are nice to have, some may find it excessive. In that case, have a look at a more affordable 4K IPS monitor with FreeSync, the LG 27UD58. ASUS has three new monitors in the works from the XG ROG Strix series, all of which will feature AMD FreeSync. 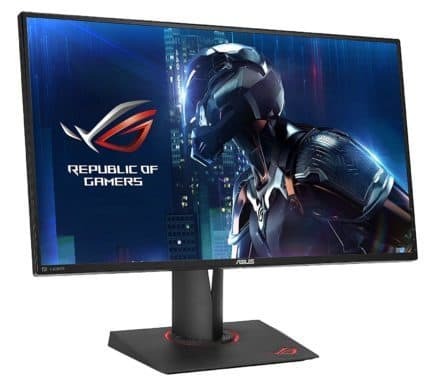 These include the ASUS XG258Q with Full HD, 240Hz, and 1ms response time, the ASUS XG27VQ 144Hz 1080p curved display, and the ASUS XG32VQ 1440p 144Hz curved gaming monitor with an IPS panel. Update: ASUS has added the ASUS ROG Swift XG35VQ curved ultra-wide QHD gaming monitor with FreeSync, high-contrast VA panel, 100Hz, and Extreme Low Motion Blur technology. It should be available in early 2018. It’s essentially the ASUS MX34VQ but more gaming-oriented and with a VA panel instead of the IPS. If you have or plan to get a powerful Nvidia graphics card, you want to use to its full potential and pair it with a G-Sync gaming monitor. Most of the modern gaming monitors are built with either G-Sync or FreeSync technologies anyway. G-Sync was the obvious way to go before AMD released their high-end graphics cards as AMD GPUs weren’t able to fully support some FreeSync monitors. Nowadays, if you’re buying both a new GPU and a new monitor, carefully research the prices and features of both companies. The ASUS PG248Q offers a flawless gaming experience suited for the professional gamers. In fact, the monitor was the official display for the ESL One tournament in 2016. With the rapid 180Hz overclocked refresh rate, 1ms response time speed, and G-Sync technology buttery smooth performance is guaranteed as well as the advantage over your opponents with regular displays. More importantly, the ASUS PG248Q is reasonably priced and quite affordable. Though only 24-inch in size, the Full HD resolution makes sure that every detail is on point and allows for the smooth performance without too hefty computer gear requirements. The design is gorgeous and thin with LED motion lights at the base and air vent which keeps the display cool. Gaming features include the GameVisual (FPS, RTS/RPG, Racing presets) and GamePlus (crosshair, FPS counter, timer) which you can toggle with monitor’s hotkeys placed beneath the OSD joystick. Connectivity includes a DisplayPort1.2, an HDMI 1.4 (max 60Hz), and two USB 3.0 ports. The ASUS PG248Q G-Sync monitor is also fully ergonomic with 100 x 100 VESA mount compatibility, 90° pivot, 60° swivel to the left and right, -5, 20° tilt, and 120mm height adjustment. A step up from the PG248Q is the ASUS PG258Q; essentially the same monitor but with refresh rate overclockable to 240Hz. The difference between 180Hz and 144Hz is barely visible to the inexperienced gamer, and it’s even less noticeable between 180Hz and 240Hz. However, if you have big intentions of making it big as a professional eSports gamer and want to take every advantage you can or you’re already a killing machine with a keen eyesight, 240Hz should quench your thirst. Other differences between the PG248Q and the PG258Q are as follows: the ASUS PG258Q provides 400nits of peak brightness (as opposed to 350 of the PG248Q) and it has a different design with slightly less swivel range. Both monitors offer Nvidia’s ULMB (Ultra Low Motion Blur) technology for less motion blur at certain fixed refresh rates (cannot be active at the same time as G-Sync. 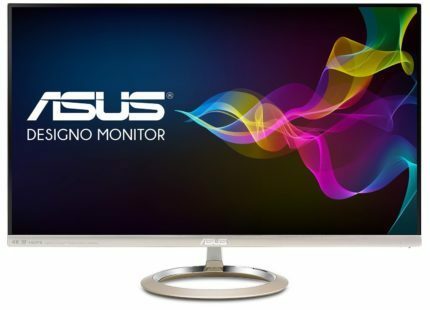 The ASUS PG278QR is the TN panel version of the PG279Q monitor which sits on the throne of this article. It offers all the same features, including the overclocking to 165Hz, except that its TN panel allows for the impeccable 1ms response time speed. However, the ASUS PG278QR has narrower viewing angles and washed out color reproduction in comparison to the IPS model – but it’s also $150 cheaper. If you’re looking for a 1440p gaming monitor, you should pick one of these beauties according to the games that you play. If you’re mainly playing fast-paced FPS games, the 1ms response time will eliminate all ghosting and smearing. 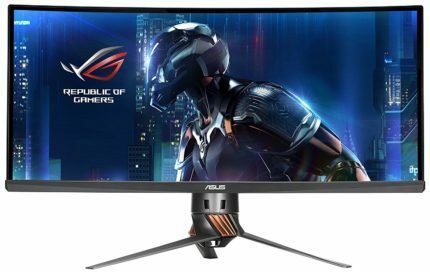 For better visual and life-like colors but minor motion blur, consider investing in the ASUS PG279Q or the following display. ASUS also plans to release an updated version of this model dubbed as the ASUS ROG Swift PG27VQ with 1800R curvature. For those with deeper pockets, the ASUS ROG Swift PG348Q brings absolute perfection to gaming. It’s based on the 10-bit IPS panel with 100% sRGB color gamut, 178-degree viewing angles, and 5ms (GtG) response time speed. This gigantic display features 3440×1440 resolution, it’s curved, has plenty of features, and a gorgeous thin design with versatile ergonomics (VESA, tilt, swivel, height adjustment). The ASUS PG348Q PC monitor offers the exclusive ROG Swift GamePlus and GameVisual features along with the TraceFree technology. Additionally, it has a turbo key which allows you to swap between 60Hz and 100Hz refresh rates depending on the type of game you’re playing. The connectivity consists of an HDMI 1.4, a DisplayPort 1.2, two downstream USB 3.0 ports, and 2x2W built-in speakers. Overall, it’s the perfect combination of high resolution and high refresh rates while G-Sync ensures fluid gameplay performance. 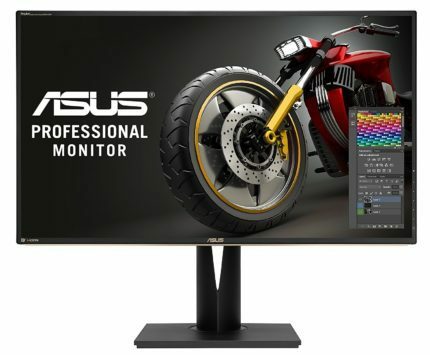 Keep in mind, however, that it’s almost double the price than the ASUS MX34VQ which offers essentially the same stuff except that it has FreeSync instead of G-Sync and not as many gaming-oriented features. If you’ve got your eyes on this display, we recommend you wait until the 200Hz ultra-wide monitors are released in 2019 after which the prices will consequently drop a bit. Or, simply save up for the ASUS PG35VQ. If you’re looking for a 4K monitor for gaming, you’ll need the impeccable GTX 1080Ti for maxed out settings at 60FPS, given that the game is well optimized. You’ll also have to rely on G-Sync technology to smooth out the performance; the ASUS ROG Swift PG27AQ offers just that. It has true 10-bit IPS panel with 100% sRGB, 4ms response time, and the stellar 4K UHD resolution make for otherworldly image detail. The ASUS PG27AQ offers full ergonomic support (VESA, pivot, tilt, swivel, height adjustment), two USB 3.0 ports and 2x2W speakers along with an HDMI 1.4 and DisplayPort 1.2. It’s flicker-free, has a blue light filter, and an anti-glare coating. Features include GamePlus (crosshair and timer) and the TraceFree technology. Currently, 4K monitors are limited to 60Hz which repulses gamers used to 100Hz+ monitors no matter the picture quality. However, if you can afford it and you’re after a 4K gaming monitor, you most likely aren’t keen on the fast-paced competitive games but rather prefer slower games with stunning scenery. In that case, the ASUS PG27AQ 4K UHD monitor is one of the best PC gaming monitors for you. The upcoming 4K gaming monitors which we can expect in 2019, will break the 60Hz ground and reach the whopping 144Hz at 4K, although you will need quite a graphics card to power it all the way. This concludes our list of the best ASUS monitors for gaming, visit our gaming monitor buyer’s guide for more displays by all brands. The ASUS ProArt PA248Q offers everything an aspiring designer or photographer needs for work. The high-quality IPS display ensures consistent and precise colors with 100% sRGB gamut. The ASUS PA248Q is factory-calibrated to Delta-E < 5 which ensures adequate color accuracy for color-critical work while the 16:10 1920×1200 screen resolution offers extra vertical space. The Quick Fit feature offers a virtual on-screen grid for easier formatting of certain pictures and documents. The monitor also has extensive connectivity including an HDMI, a VGA, a DisplayPort, a DVI-D, and four USB 3.0 ports. Ergonomics are also covered with VESA, tilt, swivel, height adjustment, and pivot functionalities. Lastly, the ASUS PA248Q LCD monitor offers the advanced 6-axis color adjustment and both 2.2 gamma for PC and 1.8 gamma for MAC. ASUS has been more focusing on gaming displays lately, and their older models are either outdated or not available at all. So, if you’re in need of an HDR monitor or a mid-tier display for designing, you’ll have to stick with another brand; you can check more photo editing monitors in this article. 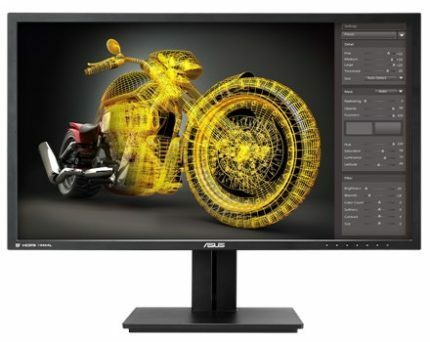 The ASUS PA329Q, however, is still popular due to its wide color gamut covering 99% Adobe RGB, 100% sRGB, and 90% DCI-P3 with support for Rec2020 standard. It’s factory calibrated to Delta-E < 2 for stunning color precision. Moreover, it is compatible with the popular hardware calibration tools and offers 14-bit LUT as well as a color uniformity feature. The IPS panel offers true 10-bit color support. There are a plethora of connectivity ports including four HDMI 2.0, a DisplayPort, a mini-DisplayPort, four downstream USB 3.0 ports, and a slot for SD cards. There’s a full ergonomic support as well (VESA, tilt, swivel, height adjustment, pivot) and an anti-glare screen coating. These are all the best ASUS monitors currently available. We hope our guide helped you decide which monitor you should get and which one you shouldn’t. We also encourage you to check out the monitors we’ve recommended for you in categories where ASUS is missing the specific type. Whenever new and better ASUS monitors are released, we’ll update the article and keep it fresh with the upcoming releases, so if you can’t find the right display for you right now – we invite you to come back in a little while!